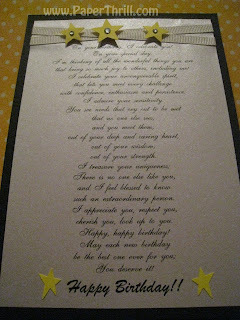 We received an order for a custom made brithday card. Our customer wanted a card with grosgrain ribbons as well as the style to be single facing for it to be framed in a photo frame. We printed the poem provided by the customer on a purplish silver pearlescent paper and then layered onto a dark blue cardstock. 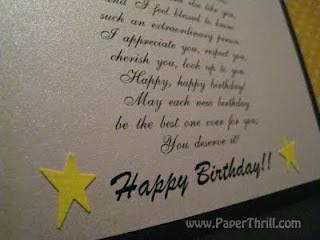 Yellow pre-cut stars was added around the card and those on the top of the card had a pop-out effect. 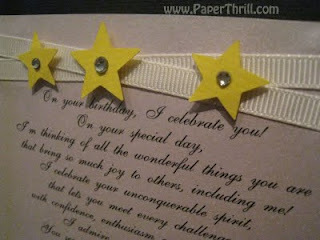 For the final touch, we added faux diamonds on top of stars for extra glam factor.